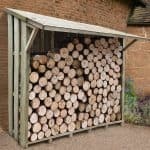 Big Sheds - Who Has the Best Big Sheds For Sale In The UK? 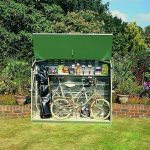 Have a lot of storage and the average 8’x6’ garden shed just won’t cut it? Here you’ll find the very best of the best big sheds available on the market. From top quality wooden big sheds to zero maintenance plastic and metal big sheds; we’ve got something for everyone in our top 20 list below. So how can you trust that the 20 big sheds featured in this league table are the best you can buy? 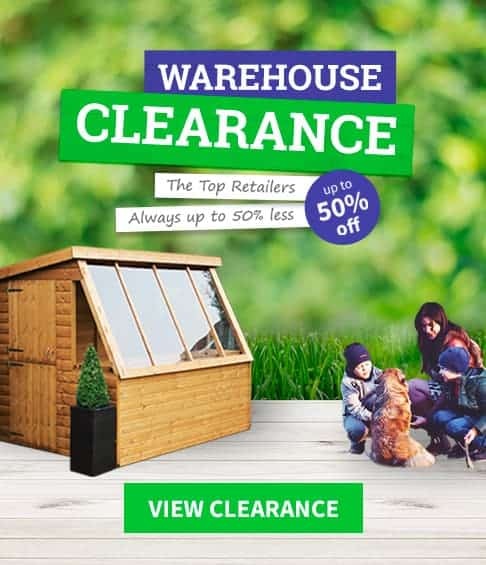 Well, we’ve spent hours researching hundreds of big sheds available across the top 10 UK retailers. These account for over 95% of the UK garden buildings market online. So you really can be sure that the big sheds on the list below really are the best off the shelf. With such a wide variety of high quality big sheds on the market, selecting the very best was no easy task. Therefore, we congratulate the 20×10 BillyOh 5000 on taking the top spot on our big sheds league table. Don’t forget to check out our in-depth reviews On WhatShed. 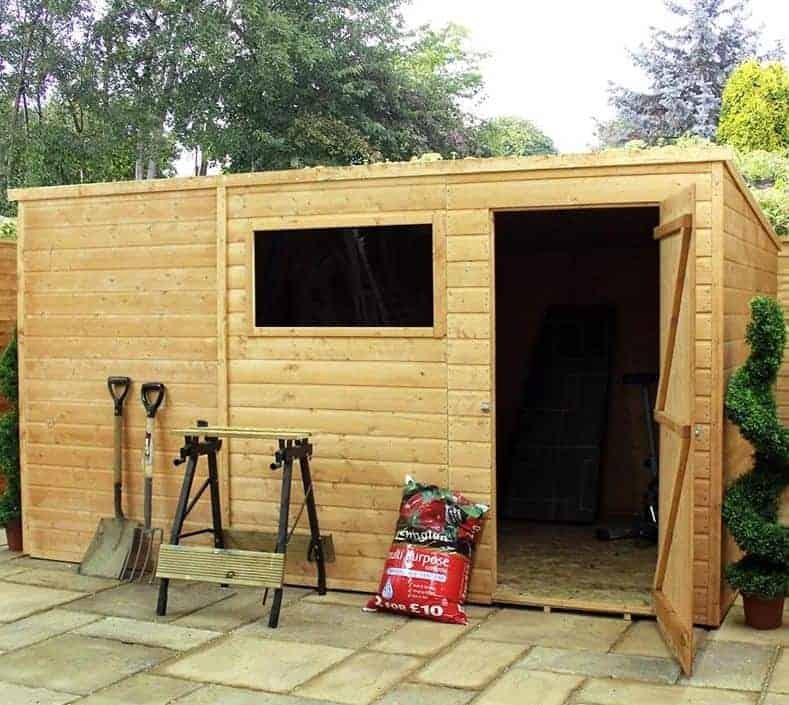 Whether you are searching for a new garage, wooden storage shed, playhouse or any other type of garden building, our comprehensive reviews can help. After a very difficult decision, the BillyOh 5000 range won the #1 spot on the list. So what made us choose this over the hundreds of other big sheds out there? Well, the 20’x10’ model is one of the biggest size sheds you will find on the market. It is worth noting that it is available in many different sizes so whatever your definition of ‘big’ is, this shed has it covered. However, it isn’t just the sheer size of this building that elevated it to the top. This model is dubbed ‘the ultimate shed’ and it really isn’t lying. There are an outstanding number of customisation options designed to ensure you get everything you want and need. No other big sheds come with so many options. For example, we especially love the fact you can add guttering and shelving, as well as choose from a wide selection of colours for both the trim and the walls. The quality of this shed isn’t shoddy either. In fact, several upgrades have been made recently such as a tongue and groove roof and cladding. You can also choose to upgrade to a tongue and groove floor. The height has also been increased, making it one of the tallest sheds available. 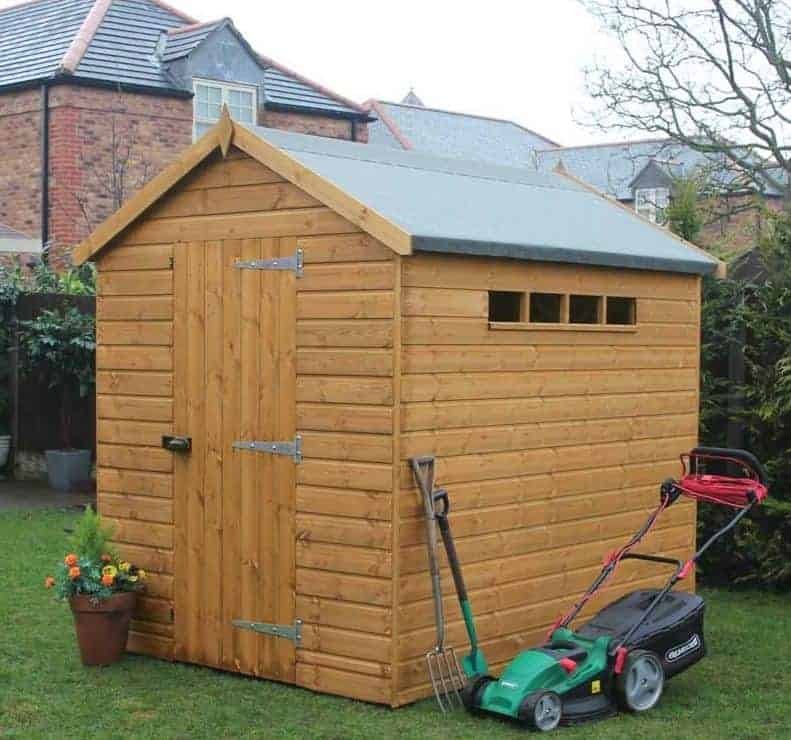 So if you’re looking for durability, quality and a shed you can really make your own, this is definitely the model we would recommend. 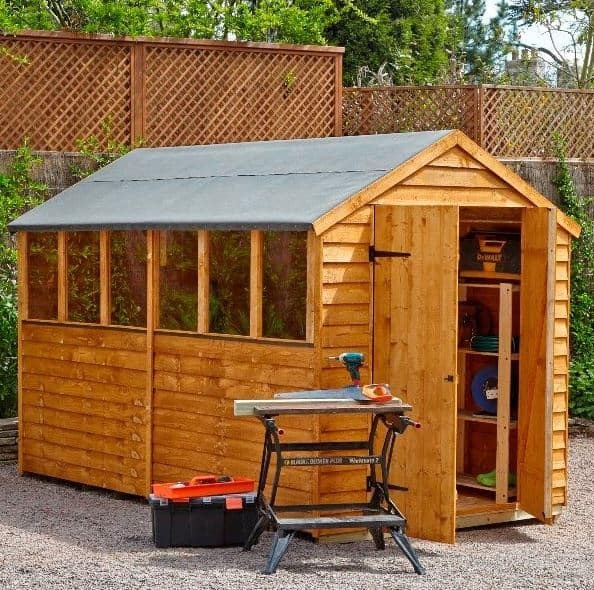 It is advertised as both the ’ultimate shed’ and a workshop. So you also have the potential to use this as a combined storage and work area. Not many other big sheds give you that option. 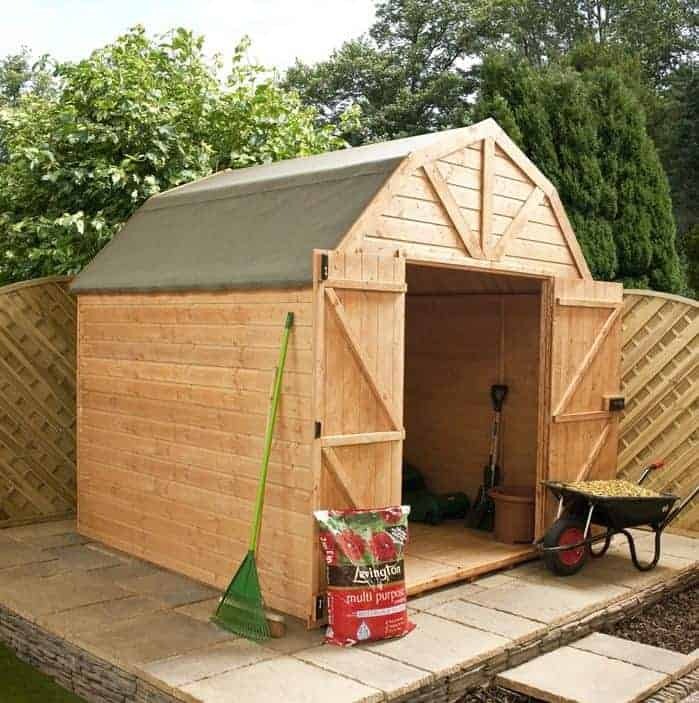 The number one shed is hard to follow, but Waltons have succeeded with this impressive 10’x6’ Tradesman Tongue and Groove wooden shed. One of the main things that has truly impressed us with this model is its incredible affordability. If you’re looking for big sheds that won’t break the bank, this is by far the most superior out there. Considering its low price, we’re surprised to see that its entire construction is thick tongue and groove. This means not only is it exceptionally durable, but it is also suitable for heavyweight storage. When you’re looking for big sheds, you often need them to hold a large range of various weight items. The tongue and groove floor ensures whatever you need to store, it will not compromise the safety of the structure. It’s also the smaller details we love about this shed. For example, the doors are well braced, making them unlikely to sag over time. There is also a rim lock included so you don’t have to worry about security. There are plenty of windows added to the shed so you’ll always be able to see what you need. All in all, this is a superb shed and definitely one of the best big sheds available in the UK today. The third spot on our top 20 big sheds list is presented to the outstanding Lifetime 11’x11’ apex plastic shed. It’s not often a plastic shed offers such an attractive design. When you think ‘plastic’ you generally envision a cheap looking, tacky shed. So prepare to be blown away by this strong, secure and chic looking model! It comes with a high price tag, but out of all of the big sheds on the market, this one offers one of the best value for money in the long term. So what makes it worth the high initial cost? Well for starters you will never need to maintain it. Being plastic, the shed is naturally weather resistant and it requires absolutely zero maintenance. You’re not just saving on annual costs; you’re also saving on time. 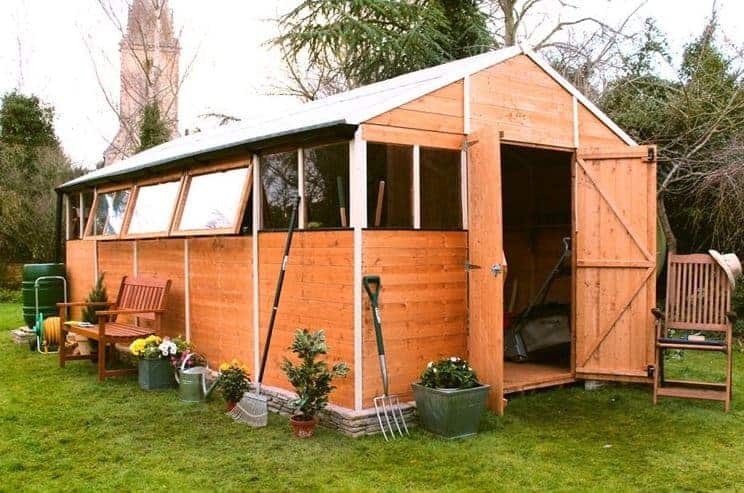 You can literally just buy this shed, assemble it and then use it for years to come. There are so many things we love about this shed that it would be hard to list them all here. The stand-out features for us include a high density polyethylene construction, a powder coated steel frame, shatterproof opening window and a full length skylight. The construction in particular is impressive as it ensures the shed will never crack, fade, peel, rot or chip. Put simply, it will look fantastic for years. Did we also mention the fact that it comes with high-security and a slip resistant floor? This truly is an outstanding shed with so much to offer. So if you have the money, this is definitely one of the big sheds you should be considering. If security is your priority when shopping for big sheds, the 12×8 Traditional Apex Shed is highly recommended. The Treetops Traditional collection has long been a favourite of ours. Every shed in their range is built with Redwood tongue and groove Shiplap and focuses on exceptional quality. This model is unique in the fact it features small, glass windows towards the top of the building. This allows light to enter into the shed without compromising its privacy and security. The windows can also be positioned at either side of the shed for your convenience. Security bolted hinges, along with a shielded padlock protector add to the shed’s security. Absolutely every aspect of this shed’s design has been created with security and quality in mind. Even the door stands out, offering a very heavy framed construction. We love that the shed focuses on style as well as security. 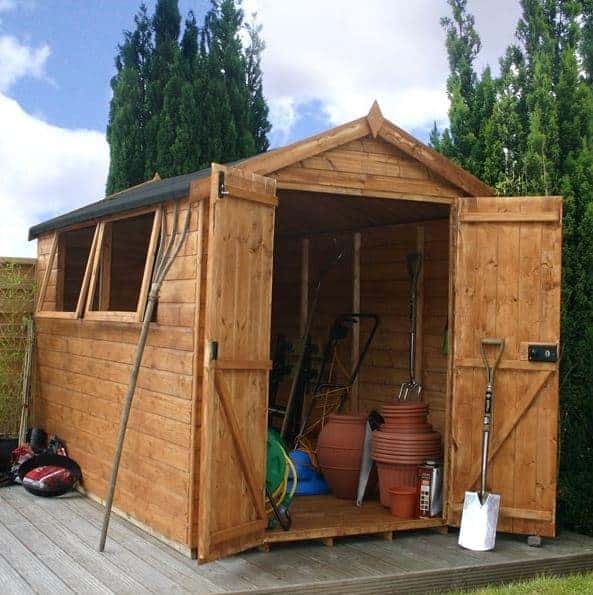 It is a very attractive shed packed full of character that will look great in any garden. Credited for its extreme durability, style, security and value for money, you’ll struggle to find better quality big sheds than this one. The Mercia Ultimate shed comes in various sizes, with the 12’x8’ model the perfect choice for those looking for high quality big sheds. The style of model compared to most wooden sheds is very unique. 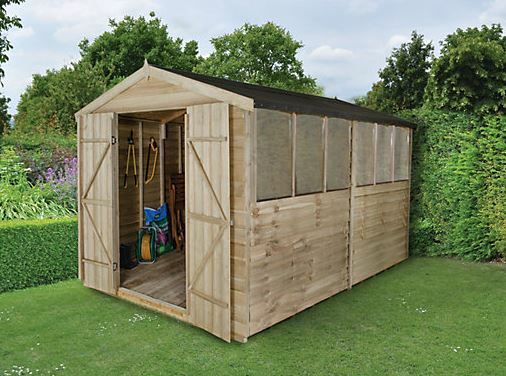 Benefitting from a two-tone finish, the shed boasts plenty of character, making it a fabulous choice for any garden. It isn’t the aesthetic benefits that made this shed feature in our top 20 big sheds list however. What has really stood out for us with this building is the strong, ultra-durable design. You’ll typically find most big sheds come with a 12mm thick cladding. This Mercia model however, benefits from super-thick 16mm cladding. What does this mean? Well it means it is a lot more weather resistant, secure and stable. Even the floor and roof of this building is constructed from thick 16mm tongue and groove Shiplap Plus. 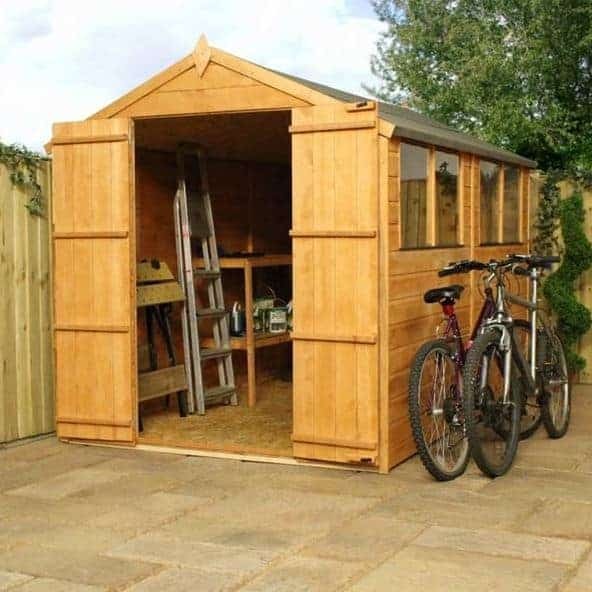 No matter what it is you want to store, this shed will provide a solid, reliable and safe place to keep all kinds of garden furniture, tools and equipment. Everything about this shed is thicker and stronger than your average shed. The glass windows measure 6mm rather than the common, thinner 4mm windows you find on most outdoor buildings. The windows are also openable, allowing great ventilation into the building. We love its versatility. Offering plenty of interior space, this shed can be used as a combined storage area and workshop. A RIM lock completes its fantastic design, ensuring whatever you use it for, you can keep the shed fully locked and secure at all times. Designed for multiple storage uses, this 10’x8’ Hipex Shed is a superb model offered by Taylor’s Garden Buildings. Redwood pine Shiplap tongue and groove cladding helps to give it a warmer, more modern design compared to most big sheds out there. However, it is the height and style of the shed that truly ensures it stands out. A great reverse apex design gives the building more character compared to the average apex shed. If height isn’t much of a concern for you, then don’t worry, there’s plenty of other features to get excited about. What is truly superb about this model is not only does it already come with some unbeatable features, but it also has plenty of extra options too. It offers total security thanks to a lock and key door and the thickness of the cladding is 15mm, with an option to upgrade. So what upgrade options do you have? Firstly, the main one that stands out to us is the option to upgrade to 18mm thick Premier Shiplap cladding or 19mm thick log lap cladding. The benefits of choosing a thicker construction include more stability and durability. You can also add to its style by upgrading to a stable style door. This shed really does have it all, making it a worthwhile addition to our top 20 big sheds list. This striking Dutch Barn style shed has been featured on several of our ‘top 20 lists’. 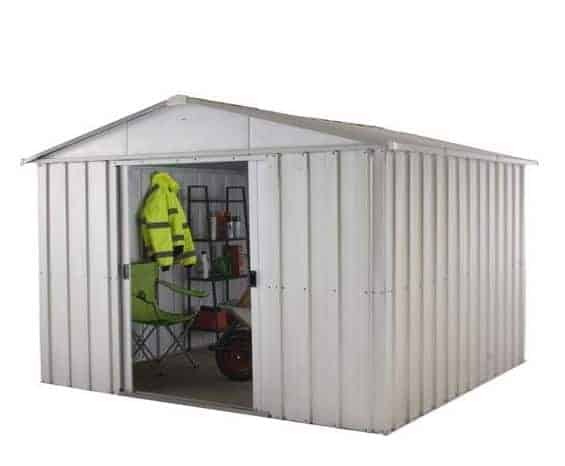 Available in several size variations, the 10’x8’ model is great for those seeking stylish, top quality big sheds. Everything about this shed is huge; making it one of the most spacious models on the list. We usually recommend the windowed version, but this windowless design makes it a brilliant choice for those seeking privacy. Once the large double doors are open, you’ll have plenty of light to see inside so the lack of windows doesn’t affect your ability to find what you’re looking for. It offers a full tongue and groove build, including the roof and floor. This means not only will it last longer than your average big shed, but it will also easily hold heavy machinery and equipment. Due to its extra-large height this is also one of the best big sheds to keep taller tools inside. If you’re looking for something unique, that will add real character to your garden then this is definitely a good choice. In our search for big sheds, Waltons definitely came out with the biggest selection of high quality models. 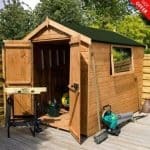 This 10×6 Groundsman Tongue and Groove Apex Garden Shed is one of the best the site has to offer. With its incredibly tough construction, this impressive looking building comes with more than a few great features. 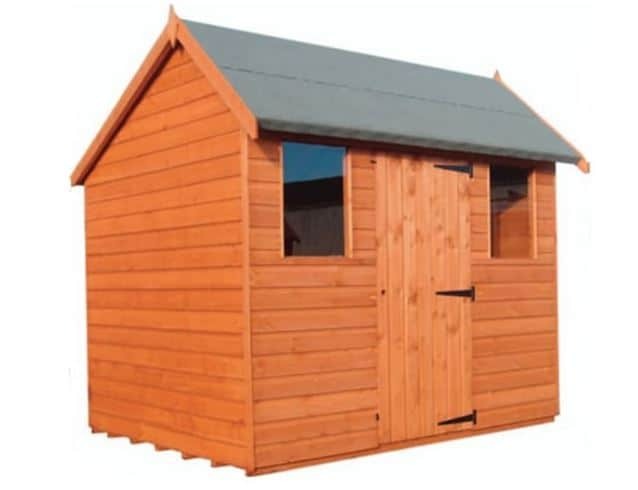 Firstly, we’d like to highlight the overall durability and stability of the shed. Thanks to 12mm thick tongue and groove exterior cladding and a full tongue and groove interior, this shed is capable of handling all kinds of storage. It is also one of the taller models on the market, offering extra-high eaves and overall height. So if you’re looking for a shed you can walk comfortably around in, this is a brilliant choice. Secondly, we love the openable windows. Now this in itself isn’t a massively unique feature, but the style of the windows is. You’ll notice they come with a thick, wooden frame, giving them a much more stylish design compared to many other big sheds out there. They should allow you to get both a good level of light into the shed, whilst also ventilating the building to prevent that ‘muggy’ feel that can sometimes present itself in wooden sheds. Of course, it also makes it a lot more comfortable to use in the warmer weather. Finally, we are also impressed that Waltons provide a free additional bearer pack. This may be a small feature, but it actually plays a very important role in maintaining the durability of the shed. Lifting it up away from the ground, you won’t have to worry about damp or rot. Not many other big sheds come with free bearers. Another plastic model to make it onto the list is this brilliant 8×10 Suncast Tremont 3 Apex Plastic Shed. It’s one of the smallest models on the list, but still offers a large spacious interior. Its design is remarkable. As mentioned earlier, you don’t typically associate plastic sheds with quality and style, but this one really breaks the mould. It features a delightful barn design and comes with stylish shingle-style roof panels created with reinforced metal. It is constructed not only with quality in mind, but also with privacy and security in mind too. There are no windows on the walls of the shed. Instead small panelled windows are added to the top section of each door, as well as six great skylights. So lighting will never be a problem and your storage will remain completely private. Despite being made from plastic; this shed is surprisingly tough. Its floor has been reinforced so that it can easily support the weight of machinery and even a tractor! Long lasting resin has been used in the overall construction of the building, known for its excellent resistance to dents and scratches. So we’re extremely impressed with the quality and style of the building but there’s one more thing we really love. It comes with 2 corner shelves which can be placed in 8 different locations. Whatever your storage requirements, this is one of the best big sheds on the market to meet them. 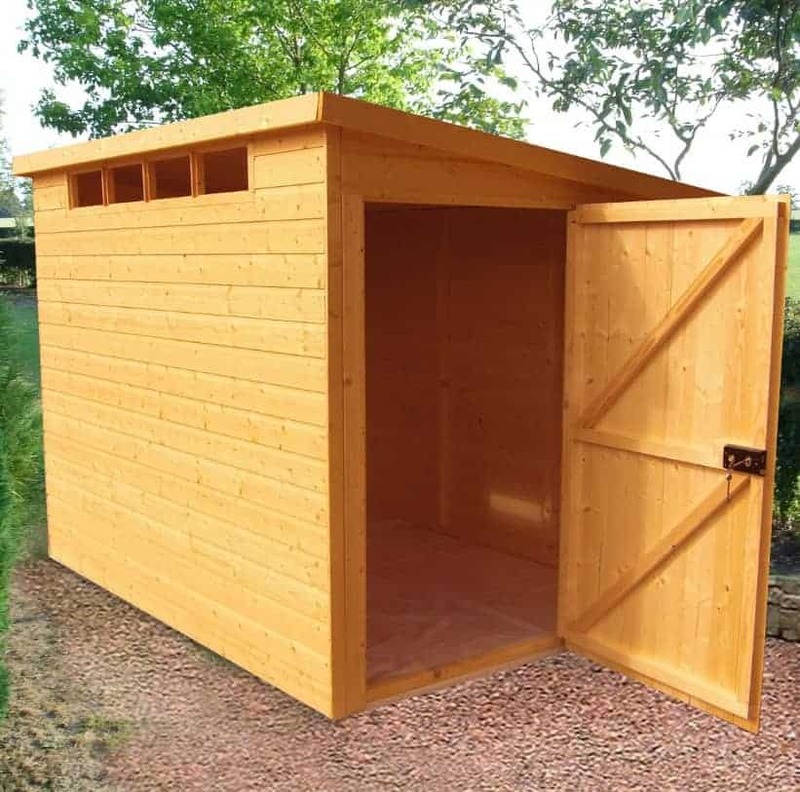 If your garden has more width than it does depth, this great quality reverse apex shed is exactly what you need. It isn’t your average reverse apex. 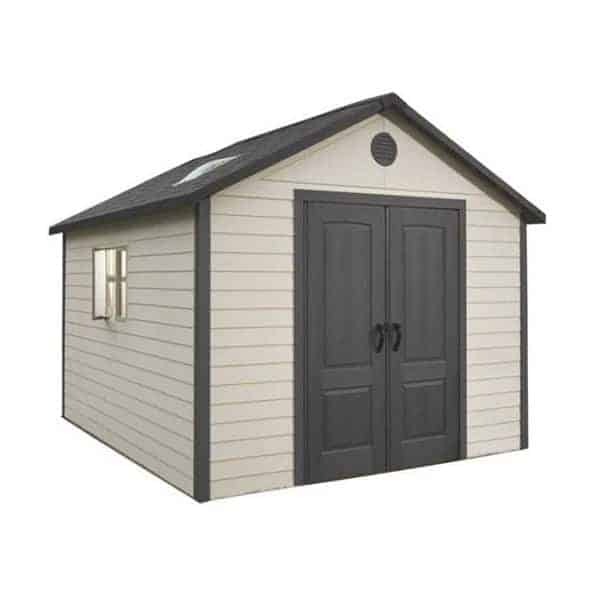 This Shed-Plus 12’x10’ Champion Heavy Duty Reverse Apex Double Door Shed is one of the best big sheds we could find. Why does it stand out? It stands out in terms of both style and durability. Designed with heavy use in mind, this tough building is capable of withstanding high levels of daily wear and tear. It’s most distinguishing features that we love include two opening toughened glass windows and extremely strong double doors. Not only are the doors built to last, but they also feature impressive security. There’s a strong key operated lock which makes sure only you have access to its contents. Not a fan of maintenance? A pressure treatment applied to the timber means not only will you never have to treat the shed, but it also comes with an incredible 15-year anti-rot guarantee. Maintaining big sheds is hard work so the fact you don’t have to worry about it with this shed is a massive benefit over its competitors. When you take into account all of its tough, long-lasting benefits you soon realise you are getting exceptional value for money. 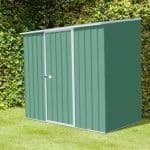 We’ve featured a lot of apex models in this top 20 big sheds list, but what if your garden has height restrictions? 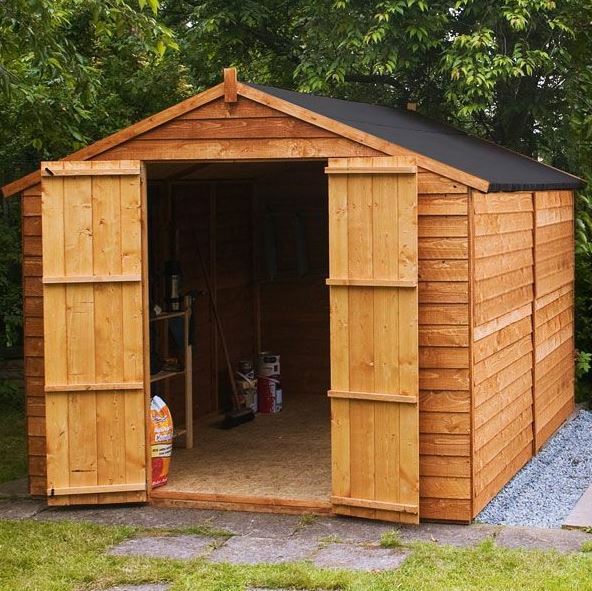 Well for those who have to account for low hanging trees, or if you would prefer to assemble the shed against another building, this 10’x10’ Pent Shiplap Wooden Shed from B&Q is the perfect option. 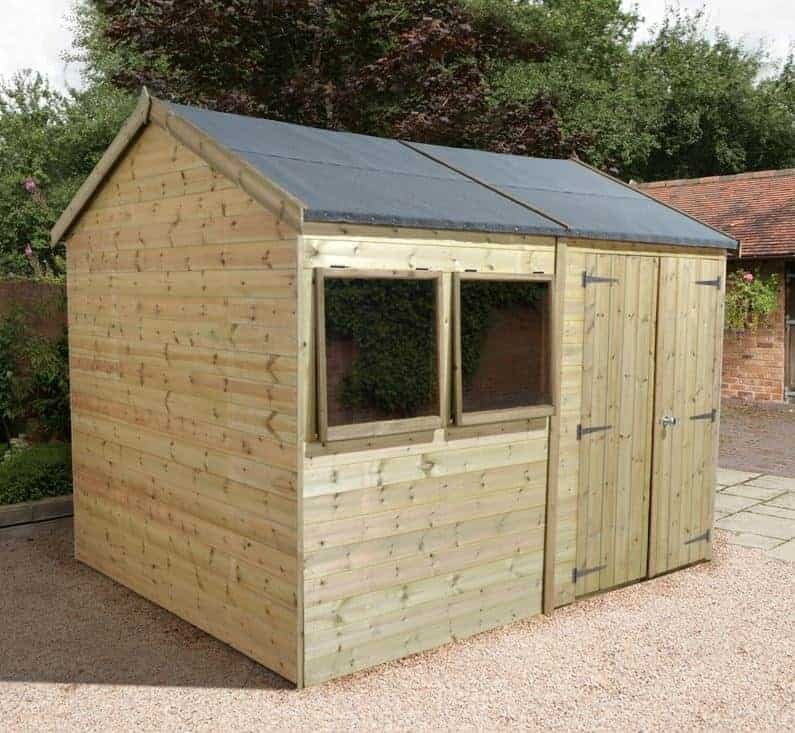 Created from softwood, this great pent shed comes with 12mm Shiplap tongue and groove cladding; promising a strong and durable construction. The pent roof offers most of the benefits of an apex roof, just without the tall height in the middle of the building. However, this isn’t just any old pent shed. We’ve chosen this model for its outstanding security. Like all good security sheds, this one comes with small windows located at the top of the building. These allow light inside the shed, while eliminating the possibility of anybody peering through. The door also has a key operated lock to complete its secure design. Another reason we included this onto the list is because it comes with a free installation service. This is the only shed on our list that comes with this feature. Putting up any garden building can be tough, but when you’re dealing with big sheds it can be a nightmare trying to install them. 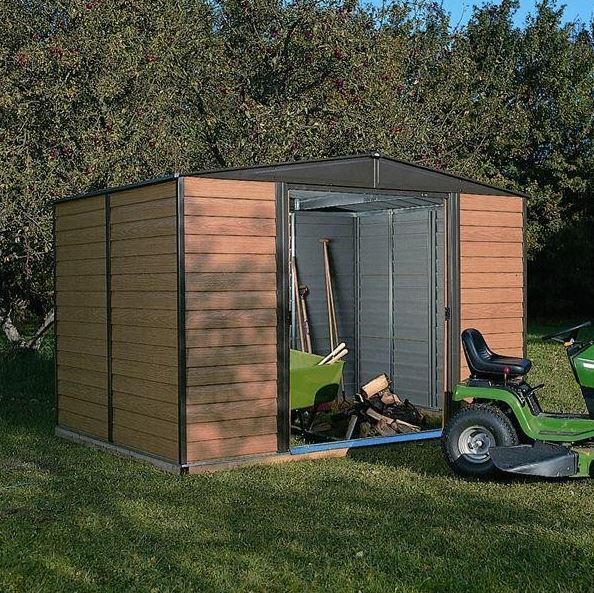 So if you’re looking for a shed you can just buy and use, we highly recommend this model. We really wanted to cover all bases when looking at big sheds, which meant looking at all construction types. This 10’x12’ metal shed from Rowlinson definitely stood out from the majority of metal sheds out there. Firstly, it has a brilliant design. Featuring two-tone colouration, this model proves that metal sheds can look stylish. However, it also comes with a few additional unique benefits that you just don’t get with wooden big sheds. This shed isn’t just rot resistant; it’s fire resistant too. So no matter what the elements throw at it or if by chance someone decides to try and set fire to it, the shed is going to ensure your storage is kept safe and dry. It’s low maintenance design also means you don’t have to worry about spending a fortune on annual treatments. Another feature we feel deserves to be highlighted is the sliding double doors. These save on space and ensure you can transport any size item without the fear of having the doors blowing shut on you. They are also lockable so if you add a padlock you can ensure your storage is theft proof too. All of these impressive benefits come at a low affordable cost. 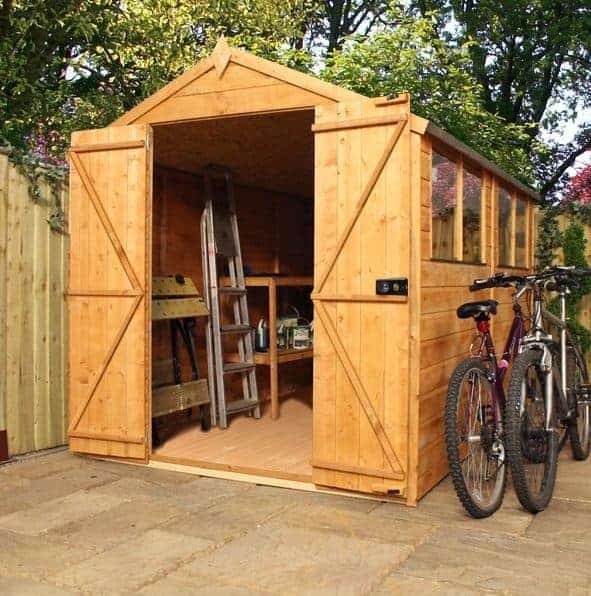 So if you’re on a budget and don’t want the hassle that often comes with wooden big sheds, this is a fantastic alternative. If quality and affordability are your main priorities, the Waltons 10×6 Tongue and Groove Apex Wooden Shed is an excellent choice. This strong shed offers a reliable and tough design that ensures it lasts for many years. One of the more basic looking big sheds on the market, considering its thick tongue and groove construction, this shed comes at an unbelievably low cost. Large, tall double doors provide convenient and fast access in and out of the shed; enabling you to transfer large, bulky items. It is fitted with 4 styrene glazed windows to supply a good amount of light into the shed and also improve its aesthetic design. We’d recommend this model to those seeking a low-cost, lightweight storage solution. If you have a lot of plastic garden furniture and light to mid-weight items, then this is the right choice. 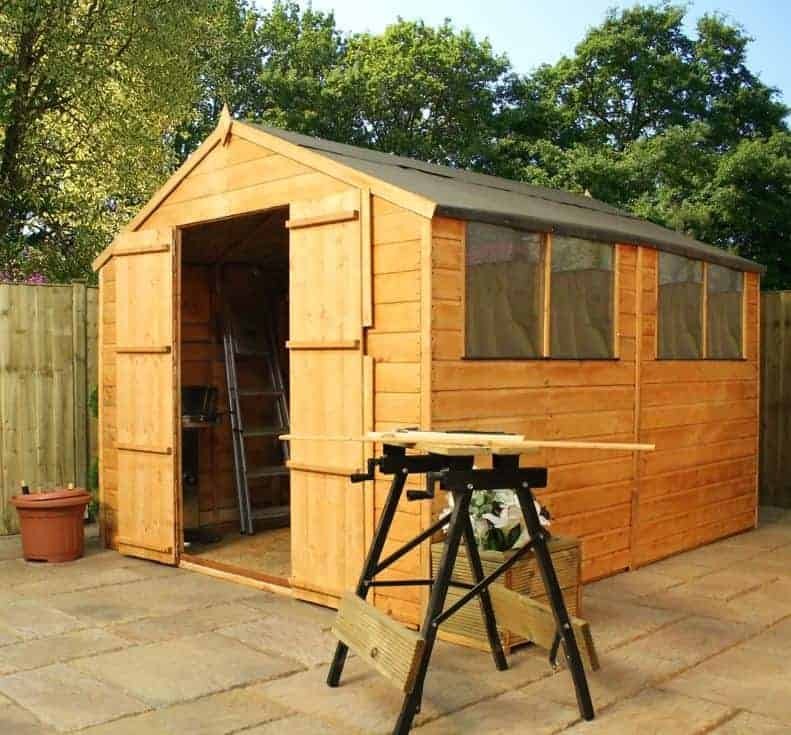 This shed has received many positive customer reviews and comes out as one of the lowest priced tongue and groove sheds on the market. We were surprised by the amount of great metal constructed big sheds there were to choose from. This 10×8 model is part of the great Store More collection at Shed Store and it comes with an exceptional design. 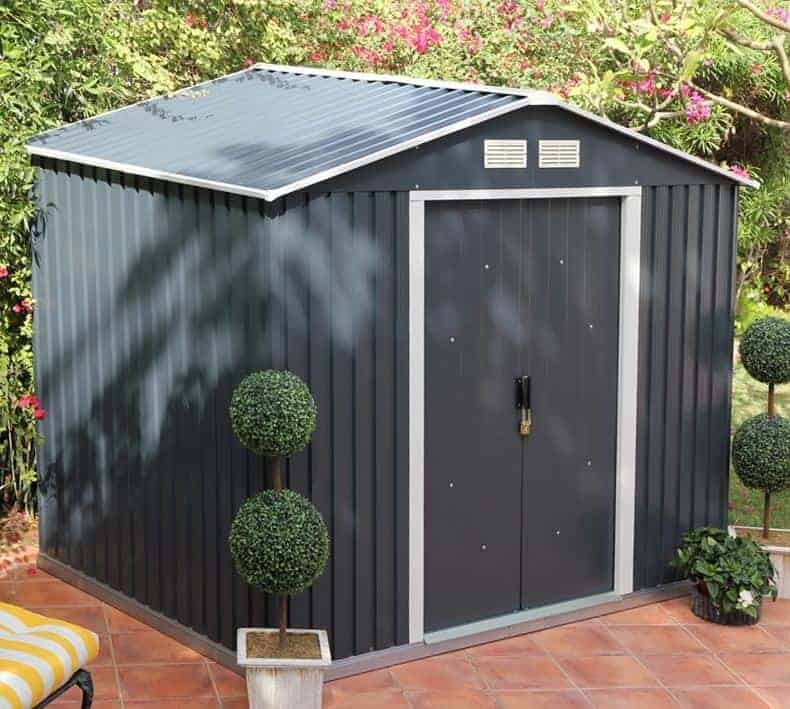 Created from hot dipped galvanised metal, it is the striking Anthracite finish complete with a white trim that really sets this shed apart. Big sheds constructed from metal can often look a little industrialised. This one however, benefits from a great stylish look that will complement any garden. Its features are impressive too. Take the sliding internal doors for example. As they are fitted from the inside of the shed, they give it a much more secure design. One of its more unique features that you will not get with any of the other big sheds available is a full width entrance and exit ramp. Vented gables ensure air is constantly circulated around the building, helping to prevent problems with rust and condensation. Add to this the metal construction is crack and fade resistant and requires no regular maintenance and you have a very good value for money building. The Windsor range is known for its strong, high quality sheds. This 10’x8’ Shiplap Double Door Shed simply had to be featured on the list for its excellent value for money. At this price range it’s not often you find big sheds with Shiplap cladding. This basically means it offers exceptional weather resistance, security and stability. We also like that it has been designed with ease of use in mind. The 3’2” double doors are wider than the ones you find on average big sheds. This means no matter what it is you are trying to transfer into the building, you won’t encounter any problems. It should mean it also offers a light, airy feel thanks to the 6 fixed styrene glazed windows. Styrene is shatterproof so if you’re choosing big sheds for your family garden, this is one of the safest out there. As it comes with interchangeable sides you can also choose exactly where you want to windows to be. All in all, this is a basic shed with a tough construction. 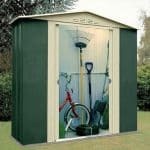 Designed to fit most people’s large storage needs, it is one of the best value big sheds we could find. This 10’x6’ Hardwood FSC Double Door Overlap Apex Shed is ideal for the budget-conscious. If you don’t have a lot of money to spend on a new shed and you require a large amount of space, this is the model for you. It is the lowest priced of all the big sheds featured on our list, yet it still provides some pretty great features. Perhaps its most significant feature is the 6 styrene glazed windows added to the side of the shed. These should let in an extraordinary amount of lighting. The styrene glazing also makes them totally shatterproof; good news if you have small children or pets! What we really love about this shed is its simplicity. If all you need is a basic, large storage area then you won’t find a better, more affordable model. It even comes with a hasp and staple so it’s easy to lock. You will need to provide your own padlock but for this amazingly low price, it’s a definite benefit considering most of its competitors come with a flimsy pad-bolt. We featured a fairly impressive, extra-strong pent shed earlier, but what if you’re just looking for a basic pent shed? Well for the budget-conscious we have this great 12’x8’ All Purpose Pent Shiplap Shed. 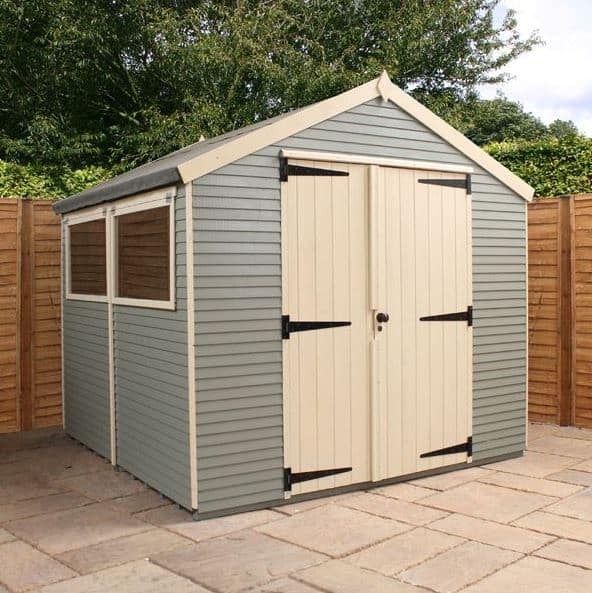 The second Windsor model to be feature on our top 20 big sheds list, this model has been designed to offer maximum storage space at the lowest cost. It’s actually pretty impressive to see that it features Shiplap tongue and groove cladding. This is very rare on a big shed at this price level. Why does Shiplap matter? Because it is the strongest, most weather resistant type of cladding available. This pent shed also has a larger than average window. Another factor that set this model apart for us compared to other pent big sheds available, is the fact the front panels can all be changed around. This gives you maximum convenience and control over how it looks and functions. The shed also comes with a strong pad bolt which allows you to add a padlock to keep your storage secure if required. Its strong, stylish look, along with its affordable cost is what makes this really stand out for us. Here we have the great value 8’x12’ Wickes Overlap Pressure Treated Apex Shed with double doors. You’ll notice out of all of the big sheds listed, this one has the shortest width. So if your garden has a lot more depth than it does width, this is going to appeal to you. Overlap sheds are designed with budget in mind. However, this one has something most overlap sheds do not – it is pressure treated. What this means is that you will never have to treat it. Come rain or shine, the pressure treatment applied at the factory will keep it fully resistant to any potential weather damage for up to 15 years. It also offers plenty of natural lighting thanks to the six large fixed styrene glazed windows. The doors are well braced and can be padlocked if you want to keep your storage secure. All of these features are something you don’t expect from your average overlap shed. So if you prefer wooden big sheds to metal or plastic models but you don’t want the typical maintenance that comes with them, this is highly recommended. 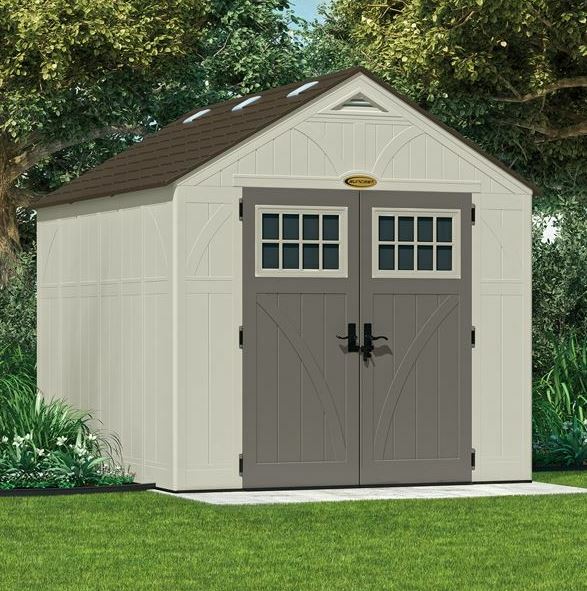 We’ve featured a few metal construction big sheds on this top 20 list and this is the best budget-friendly model we could find. Not only is the Yardmaster Apex Roof Metal Shed 10’x13’ affordable, but it also comes with some great, useful features. Its zero maintenance benefits will no doubt appeal to most, but it’s the unique features such as pad-lockable sliding double doors which really stand out at this price level. These should allow great easy access into the building without the worry of them ever blowing shut as you’re transporting items in and out. Being able to padlock them also gives you peace of mind if you need to store anything of value. The stylish silver colour of the shed also gives it a modern, attractive design. Created from 100% galvanized steel, it even comes with a 10-year warranty. So if you’re looking for a strong, long-lasting, big storage shed that you will never need to maintain, this is definitely the one to go for. At number 20 on our top 20 big sheds list we have another budget shed. The 12’x8’ Waltons Windowless Overlap Apex Wooden Shed is a private, basic shed with a very low price tag. Out of all of the big sheds we looked at, this proved to be one of the lowest priced 12’x8’ sheds on the UK market. Created with traditional style overlap, it is the perfect option for those seeking a light-medium weight storage solution. Its main benefit is the totally private, windowless design. This also gives it more of a solid look. It also features something not many budget sheds do and that’s strong, braced double doors. Ensuring they won’t sag over time, this feature adds real stability and durability onto the building. Another unique advantage of this model over its similar priced competitors is the fact that Waltons throw in a free tub of treatment and an additional floor support pack. We also like that although the standard features are fairly basic, you are given the option to upgrade. For example, you can improve its durability by upgrading to Superior roofing felt, as well as creating an even sturdier floor with the extra-strength floor support pack. All in all, this is definitely one of the best budget sheds available in the UK.